O&K Print Watch can automatically detect the parameters of devices that support the SNMP protocol. Description — The name of a printer or multifunction device. Model — The device model. Manufacturer — The device’s vendor. Serial number — The device’s serial number. 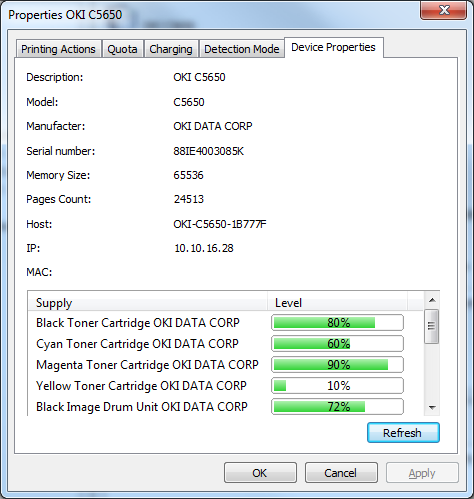 O&K Print Watch can also detect the serial numbers of USB printers that don’t support SNMP. Memory Size — The amount of built-in memory. Pages Count — The printer’s internal page counter. Host — The host name. IP — The IP address. MAC — The MAC address. Supply — The device’s resources, such as a toner cartridge or drum unit.